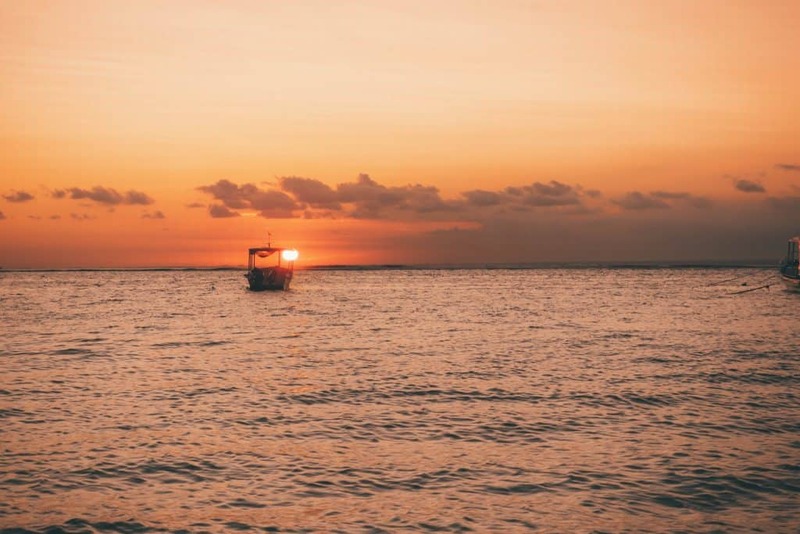 Just a 45-minute boat ride away from Sanur Beach is Nusa Ceningan – one of the Nusa Islands. 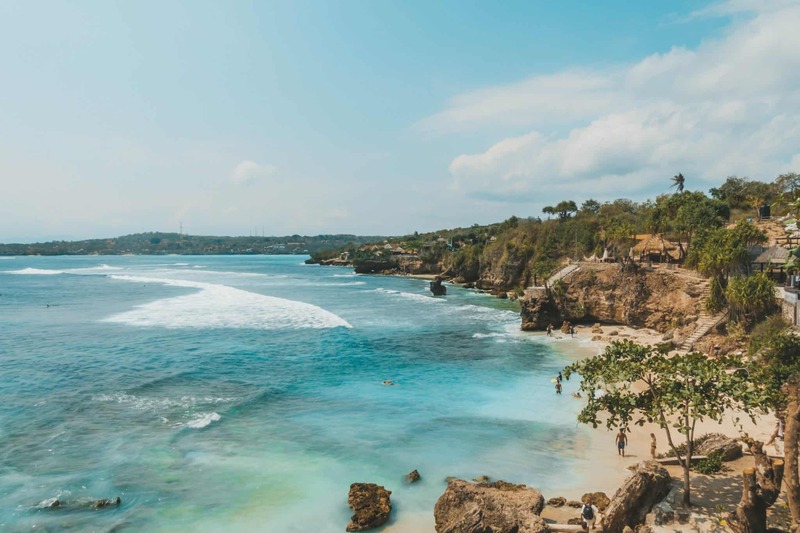 Nusa Ceningan, Nusa Lembongan, and Nusa Penida all make up this island group and a trip to explore them is a great addition to any Bali trip. We spent a few weeks in August in Bali, we were growing a bit tired of the beaches and overwhelming crowds. Thankfully, we had an option to escape and explore the Nusa for a few days. The waters surrounding the islands are picture-perfect blue and the beaches are made up of a fine white soft sand. 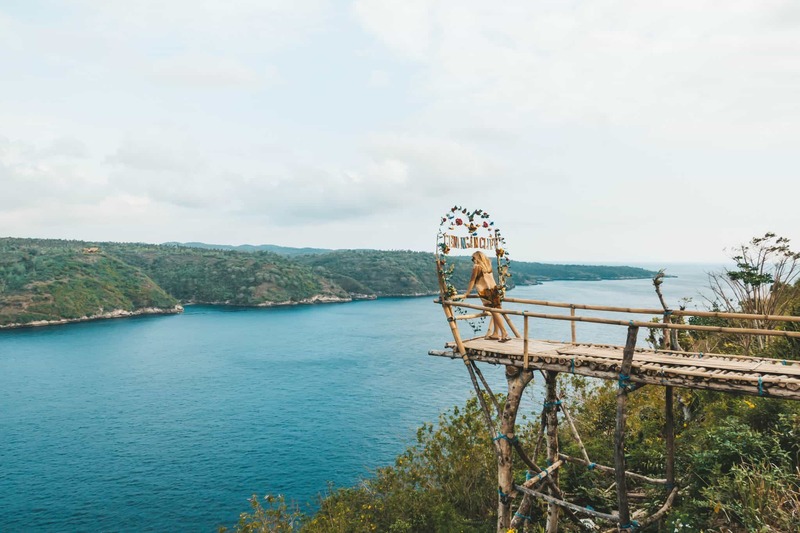 With far less infrastructure the islands are less crowded than Bali (although we’re not certain how long that will last), and offer visitors a more rugged adventure in Indonesia. We spent 10 days on the three islands and found each to offer something different, each worth a day of exploration. Here’s all you need to know about Nusa Ceningan. 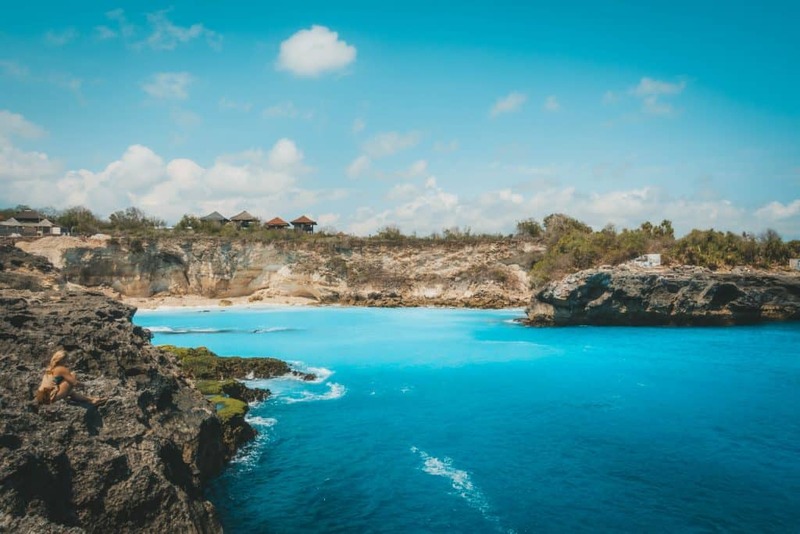 Out of the three Nusa islands, Nusa Ceningan is the smallest and located right in between Nusa Penida and Nusa Lembongan. It’s super easy to get to from either island so there is no excuse for not making your way over. Even if you only have a few hours it’s well worth a half day trip. The cliffs are rugged, surf is good, and the water is impressively clear. It’s possible to walk from sight to sight, however, if you’re short on time or don’t like to sweat I wouldn’t recommend it. Renting a motorbike is the best option for getting around the Nusa Islands. The general price for a motorbike on the Nusa islands is 70,000 IDR-85,000 IDR, you may be able to get it lower depending on the season and how good your bartering skills are. Yes, these prices are about double the prices on Bali, but with a less developed island and high demand, good luck getting it any cheaper. 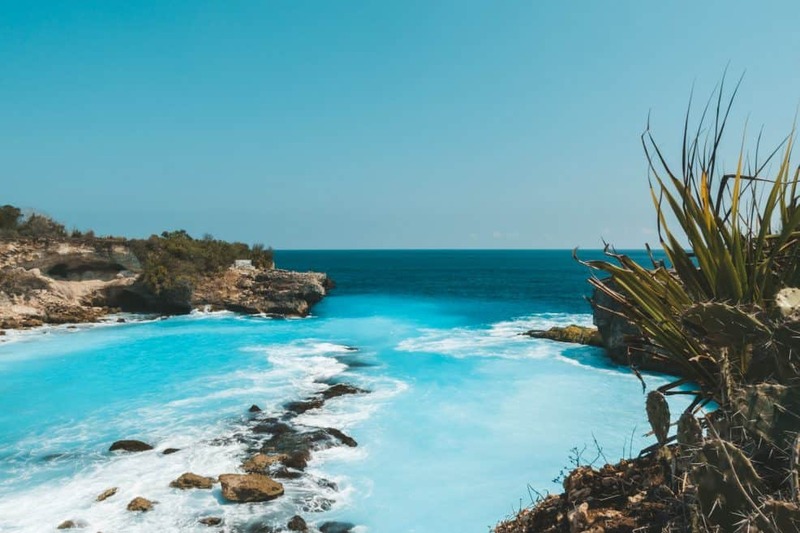 The blue lagoon is the most popular thing to see on Nusa Ceningan. Once you arrive on the island just turn right from the bridge and keep following the road. After about five minutes you’ll find a parking area on your left-hand side, and there will be a handful of other people and motorbikes stopped. It’s hard to miss, but in case you think you will pass it just drop a point on Google maps. Prepare yourself for the lightest blue water you have ever seen. It’s possible to walk around the blue lagoon and see it from different angles although the rocks can be sharp and painful if you are barefoot. It’s also possible to cliff jump, although this should only be reserved for competent swimmers as the water can get very rough and exiting will prove tough. It’s pretty easy to go snap happy here. Before you do, make sure you take a few minutes to soak in the water and beauty without the camera. We’ve got a healthy Instagram following but we were shocked by the amount of time those around us spent taking photos of the lagoon. Relax guys! Just down the road from the Blue Lagoon is Mahana Point. If you’re looking for thrills it is a much safer cliff jump with a few access points. Please note that they do charge 50,000 IDK a jump which is a bit of a rip off so we gave it a skip. Also plan to jump during high tide! There is also a nice, but small beach for lounging. Surfers will enjoy the break in this area. The break is pretty easy to access via the point so if you are looking to learn this may be a good place to rent a board and jump in! Of course, the swell size is dependent on the season. Checking out “Secret Beach” is another popular thing to do. However, I didn’t find it so secret as many other people were there. The beach is accessible via a small hotel and restaurant and they will request you either buy something there or pay to use their pool and access the beach. Honestly, the beach didn’t seem like anything special to us and if you arrive after 1 pm it won’t be in the sun anymore so we decided to give it a skip. After hitting all the best things to do on Nusa Ceningan in a few hours we were eager for more things to explore. I mean there had to be more things to do, right? So we hopped on the motorbike and hooked a left after exiting the bridge instead of a right. We kept driving down the road and up a fairly steep road. This led as to the Ceningan cliff point hotel and restaurant and an amazing lookout over Nusa Penida. It’s clear the owners here built their own makeshift cliff walk with a heart as a draw for social media. If you do decide to head here and access their cliff walk we would advise you have a drink or some food. We went with two iced coffees for 15,000 IDR each, a fair price to pay to sit and have a great view! It’s possible to stay on Nusa Ceningan. There aren’t any major Nusa Ceningan hotels; however, there are a few different accommodation options. We saw many buildings going up all over the island so expect more options in the future. Some good ocean view spots are The Bridge Huts and Svaha Private Villas Ceningan. 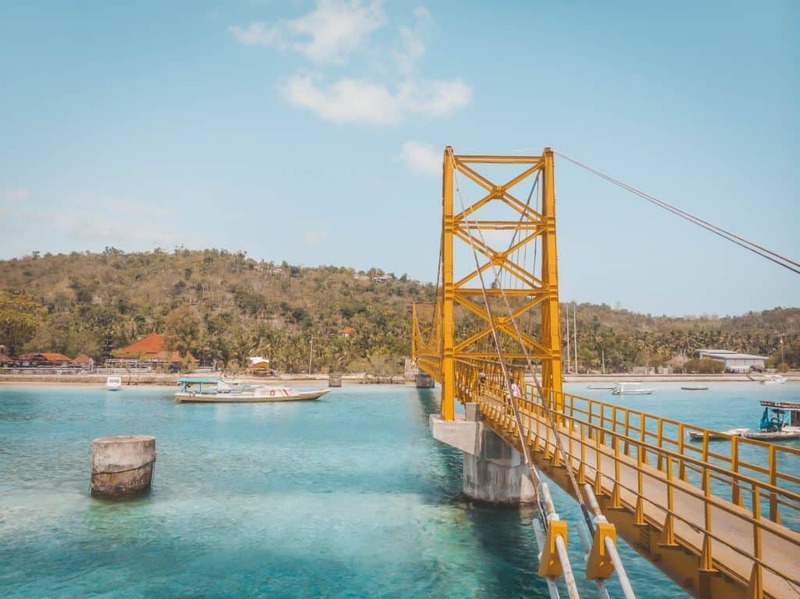 The other option is to stay on Nusa Lembongan and head over the yellow bridge whenever you want! 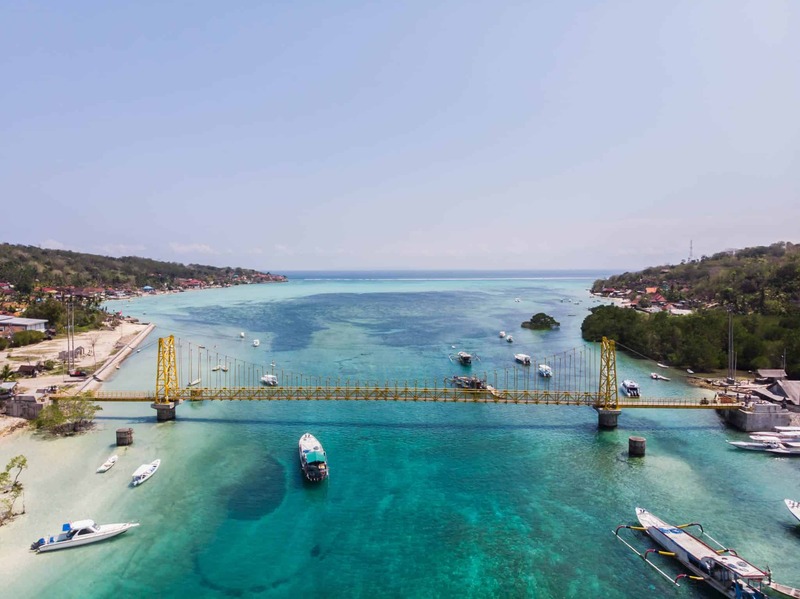 There are more accommodation and food options on Lembongan along with better infrastructure. We personally booked in advance on Airbnb, but it’s possible to show up and find a place to stay. Although we wouldn’t recommend that in the high season. As mentioned the island is very small and there are not a lot of things to do on Nusa Ceningan. 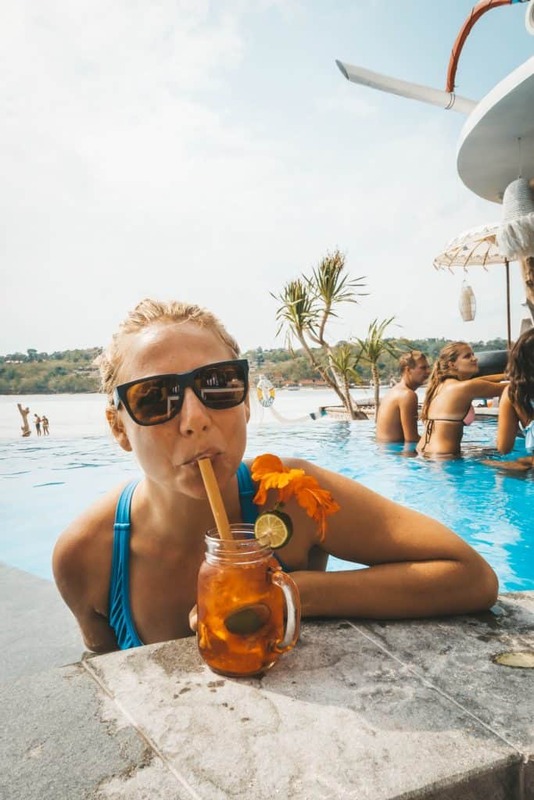 I think a full day over here is plenty of time to check off all the fun activities and still have some time to relax in the sun at one of the beach bars. Once you enter Nusa Ceningan and start riding around you’ll notice the shoreline is a mecca for beach bars, swing sets, hammocks, and cafes. It’s a great place for chilling out in the sun, wading in the warm shallow water, and drinking a cocktail while looking at Nusa Lembongan. We found the perfect place to chill at Sea Breeze. They served up delicious drinks, had plenty of lounges, a pool, took credit card, and decent food (don’t get the chips and guac though – you will 100% be disappointed). If we had to guess all of the bars are about the same, so take your pick. 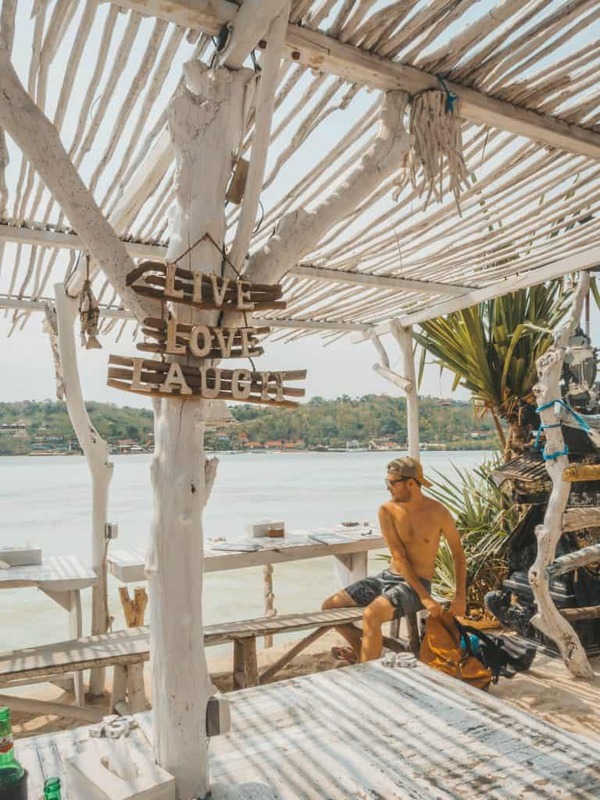 Another thing you will notice about these beach bars is how well set up they are for taking Instagrammable photos. Like the rest of the Nusas and Bali, business owners have capitalized on peoples want to share on social media. Along the water, there are swing sets, hammocks, and a few beach nets with signs that are fun and beachy. The Nusa’s are pretty Instagrammable in general, but these spots take it to the next level. There are no ATM’s on Nusa Ceningan so come prepared with some cash. We came to the Nusa Islands with enough cash on hand from Bali because we heard the ATM’s on Nusa Lembongan regularly malfunction. However, if you find yourself out there are two semi-reliable spots on Nusa Lembongan to pick some up some cash. There is no direct ferry to Nusa Ceningan. To get to this island you will need to first get to Nusa Lembongan. Once on Nusa Lembongan, Ceningan is only a few kilometers away. The way to get there without getting wet is via the yellow bridge. The yellow bridge is a short distance across and you can walk or drive a motorbike across. Head caution to the weight on the bridge as it may have collapsed and killed people before. It’s probably safe now though! Nusa Lembongan and Nusa Ceningan are very close to each other so your other option is to swim between the two! The water is generally very calm and isn’t deep so if you want to get a little activity then it’s an option. I suppose you could also hire a local boat, but I never saw this and don’t know why you would bother. If you’re coming from Nusa Penida you can take a local boat for 50,000 IDR to Nusa Lembongan. You will be dropped off right next to the yellow bridge. Packing: It can get real dusty riding around the Nusa Islands on a motorbike. Wearing a buffwill protect your face from all the dirt.